This was originally posted to Kate Bowles's blog [https://edtechbooks.org/-uPo] on September 6, 2016. The question for me is how the idea of “own” works as a metaphor. It’s complicated enough as it is: my own, to own, owned, owned [https://edtechbooks.org/-EFr]. We own our mistakes, we own our work, we own our politics, and none of this is quite like the way we own our homes—which for most of our working lives means some version of renting, in a funhouse world in which access to credit, like debt itself, has become an asset. As companion pieces, I read Maha’s further post on how things get paid for in Egypt [https://edtechbooks.org/-ZVu]; Audrey’ post on the impact of student debt on credit score [https://edtechbooks.org/-jRj]; and two articles by Tressie McMillan Cottom, on the $20 principle [https://edtechbooks.org/-SSF] and on preferential student recruitment as reparations for slavery [https://edtechbooks.org/-USS] (spoiler: it’s not reparations.) Then I fell into this exchange [https://edtechbooks.org/-KNh] on Twitter about the critical importance of making small barriers to educational participation visible, kicked off by Robin deRosa reminding her students to bring a credit card and working laptop to class. [https://edtechbooks.org/-SJk]This weekend I walked past a house that I like. It’s in a gentrifying Sydney neighbourhood, defying the trend. It’s been taken over by an unpruned wisteria draped over its rotting balcony; curtains are never pulled back from its verandah doors. Who knows what’s inside? Who lets their property, in Sydney of all places, fall into this unproductive, vegetative state? But now there’s a notice stapled to the fence. Development is planned. The house will be demolished and replaced. There will be a plunge pool. 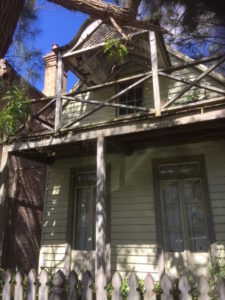 This abandoned property will retake its place in the proper, and properly owned will become an asset to the whole neighbourhood in house price uplift. Ownership can never be less of a public spectacle than this. Its whole point is to be knowable by others, to turn exclusivity of access and control towards a model of social order and a vision of security that will miraculously extend to all, including those who are most obviously excluded. Owning and gentrifying are inseparable economic forces. So when we talk about securing a domain of one’s own, we’re also talking about this privatising vision of the proper—and we’re at risk of missing the fragile, important lesson that just as with homes, the security of ownership is always measured against the temporality of the bodies walking past. Note: This blog is parked with Reclaim Hosting, [https://reclaimhosting.com] for whom my admiration is unreserved. None of the questions I’m asking here are a criticism of their model.